Imam al-Qushayri said that those who read, memorize, study, and understand the Qurʾan are the people intended in the hadith. The key to connecting to the Book of Allah is the proper manners of reciting, studying, and teaching. 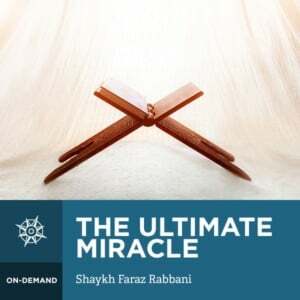 Shaykh Faraz Rabbani clearly explains what the Qurʾan is, how it was preserved, and how one can maximise the benefit received from the Qurʾan in order to become one of those mentioned in the above hadith. What would you ask God if you were granted the opportunity to ask one question? “My Lord, what is the best means with which those close to you have gotten close to you?” Imam Ahmad asked when he saw Allah for the hundredth time in his dreams. “With my words, Ahmad” was the response he got. “With, or without understanding?” he enquired; “With, or without understanding” was the answer. The proper manners with the Qurʾan can supercharge the benefit received from the Qurʾan, whether one approaches it as a worshipper, a student, or a teacher. Shaykh Faraz Rabbani explains what the Qurʾan is, and shows how it was perfectly preserved. This preamble imbues the listener with a certainty of the Qurʾan’s divine origin. He then discusses the numerous virtues of this blessed book, and how one can gain the maximum benefit from it through proper outward and inward conduct. This course is essential for those wishing to gain closeness to Allah through His Book, and flings wide open the doors to having a direct connection with Allah through His words.